New Kids on the Block were guests on ABC’s “Good Morning America” earlier today to announce their upcoming tour called “The Main Event”. The tour will take place in late spring and early summer, from the beginning of May until July. This tour includes tourdates in the United States and Canada. A few minutes into the interview NKOTB revealed the two acts that will join them for the tour: TLC, who were also guests on the show and Nelly, who left a video message due to his commitments in Japan. NKOTB’s Block Nation pre-sale begins on Thursday, January 22nd. Regular tickets will go on sale on Saturday, January 31st. The AMEX pre-sale will start on Friday, January 23rd. Drum roll please….This summer we’re heading back out and will be headlining THE MAIN EVENT TOUR! Not only will we be hitting 40+ cities across the US and Canada, we’ll be bringing special guests TLC and NELLY along with us. 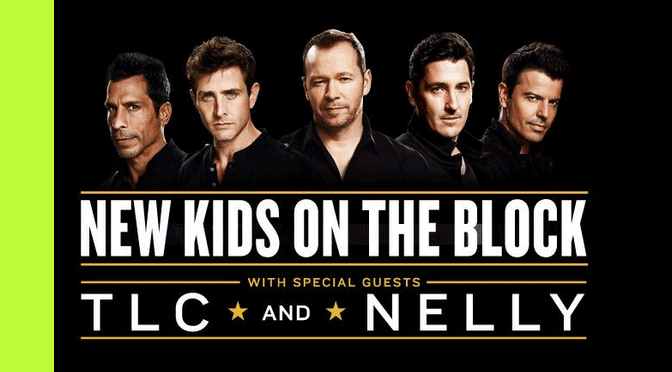 You heard us right, this is an all new New Kids on the Block headline show. We’re pretty much bringing all the hit songs to you! To make it even better- we have an exciting new stage design, performing 360 degrees in the round. This new production gives you the chance to see us up close and personal and for us to be close to all of our Blockheads. And for the first time we’ll be offering stage-side bar seating in our TOP SHELF VIP PACKAGE which also includes access to THE RINGSIDE EXHIBIT showcasing memorabilia from each of our personal collections over the years. Click here to see all that the VIP packages have to offer. It’s gonna be an epic party and we want you to be there. Block Nation pre-sales begins January 22nd. You must be a Block Nation member in order to participate in the pre-sales. If you’re not already a member, sign up here! All other info can be found at www.nkotb.com. We love you guys- thank you for being part of our family. Can’t wait to see you at #TheMainEvent! For official information please visit NKOTB.com.